Season 7 of The Walking Dead (TWD) started off with a bang by killing off a main character. Don’t worry — I won’t say what happened. But this is not the first time TWD has discarded a major character, nor is the show unique in its penchant for offing fan favorites when least expected (e.g., Game of Thrones). The question is: Why is this storytelling technique so frustrating, yet compelling? The answer is all about execution. No pun intended. Spoilers below for (1) The Walking Dead, (2) Arrow, (3) Breaking Bad, (4) The Wire, (5) Game of Thrones. Each show’s name and season are listed after every point for those who want to skip around. Glenn’s “death” in the first half of Season 6 is the quintessential illustration. 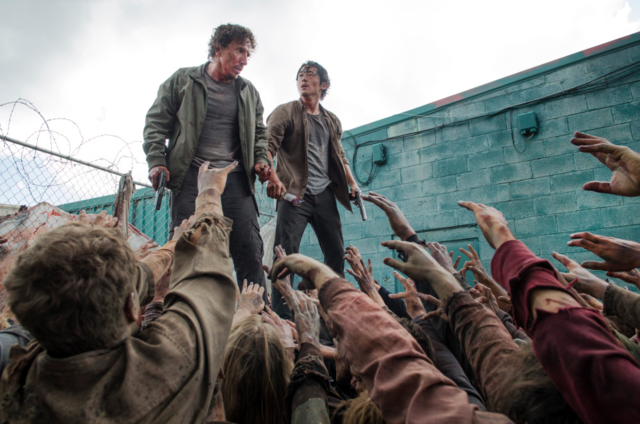 At the end of episode three, “Thank You,” another character shoots himself in the head, inducing him and Glenn to fall together into the swarm of zombies below. The final shot of that sequence led viewers to believe that Glenn was subsequently eaten alive, although there was just enough ambiguity to make it uncertain. TWD then waited four more episodes before revealing what really happened: Glenn actually was able to crawl underneath a dumpster and escape from the walkers (albeit with significant effort). If the intention was to build suspense, showing Glenn survive the fall and escape under the dumpster before ending the scene would have been much more effective. In that scenario, viewers would not only have a more accurate understanding of what’s going on but also better realize the emotional stakes at the start of the next episode. Unfortunately, TWD chose to deceive its viewers rather than entrust them with a tense, well-formulated escape sequence. Okay, so it worked for Gandalf. And Harry Potter. But hey, those are the exceptions to the rule, right? Khazad-dûm was not only a necessary event to produce “Gandalf the White,” but it was also a perfectly executed emotional and narrative peak in The Fellowship of the Ring. Similarly, Harry’s death is both an allegory as well as the climax of his character’s arc. None of those factors play a role in Arrow; instead, the show merely comes up with a convoluted (and repetitive) way to dispose of and restore characters as a proxy for plot development. Although we aren’t asserting that Arrow is anywhere close to being part of the Golden Age of Television, the show’s obvious — and persistent — shortcomings are instructive. In Arrow, both Thea Queen and Sara Lance die and are resurrected through the Lazarus Pit — a mystical pool of regenerative waters that can heal wounds, defer aging, and apparently bring people back to life. Ironically, viewers are led to believe that Sara’s character dies in the first season, but she subsequently shows up on the island where Oliver was shipwrecked. It’s a fine reveal that’s significantly cheapened the second time around. The difference between a well-executed, earned death and a cheap one is oftentimes determined by the aftermath. The narrative consequences and interpersonal repercussions of eliminating a key character can be monumental. But if a show immediately brings a character back to life, it precludes the rest of the cast from grappling with the loss. Rather than creating openings for other individuals to grow, a contrived return stifles the maturation process and circumvents authentic turning points in other character arcs. Arrow tried to have its cake and eat it too, overcrowding the show and harming real character development. Simply put, bringing back characters lessens the emotional stakes and harms credibility with viewers. It’s also a tactic that has diminishing marginal returns and permanently cheapens the impact of any future character deaths. AMC’s groundbreaking drama is filled with exceptional character development and jaw-dropping narrative twists and turns. Oh yeah, and a lot of important characters die too. However, one of the most monumental deaths takes place at the end of Season 3 (it is literally the final scene). As the season progresses, drug kingpin Gus Fring increasingly sees Walter as a liability and tries to manipulate him and Jesse into grooming a replacement chemist, Gale, for Gus’s drug empire. Long story short, Walt convinces Jesse that they are in an “us or them” situation and prompts Jesse to murder the replacement to ensure that they keep their jobs — and their lives. In some ways, this is one of the most important inflection points of the show: It fundamentally changes the relational and power dynamics between Walter and Jesse; it further hardens Walter into the man he becomes by the end of the series; and it sets off Jesse’s downward spiral — one of the most compelling and disturbing arcs of the show (which also brilliantly sets up his relationship with Mike). Viewed in context, Gale mattered more in death than in life. When a character is larger than life sometimes a mundane end can be most fitting. 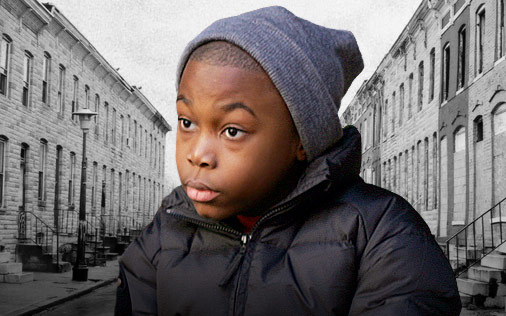 The Wire is filled with tragic and heart-rending character deaths (“where’s Wallace at? !”), but Omar’s stands apart because it contrasts with his ability to evade death in far more dangerous situations. Up until that point in the series, Omar is practically invincible. After avoiding death time after time through ingenuity, talent, and sometimes luck, Omar is offed in an unheralded and frustrating way. His death also emphasizes a crucial narrative feature of Season 5: The Baltimore Sun doesn’t even realize that Omar’s death is a huge development in the overall trajectory of the city’s drug wars — a fact that clearly dovetails with the “our newspaper missed every major story” theme. In this episode, previous instances where Omar manages to narrowly escape in almost superhuman fashion are juxtaposed with a simple and senseless death. He’s larger than life in the eyes of the city — dealers, hoppers, and cops alike — but still human. While it’s a sobering commentary about the banality and ubiquity of violence stemming from the drug war, Omar’s example also demonstrates that important character deaths don’t have to be grand to be impactful. Game of Thrones has such a massive following because it features amazing, multifaceted characters, and none of them are truly safe. But this show has never been for the faint-hearted: For every despicable villain who is dispatched, dozens of beloved characters are picked off in violent, unexpected ways. While many of these deaths happened in an unpredictable fashion, most were a long time coming. Nevertheless, it’s a true testament to great writing that one of the most impactful deaths happened to a character with a small amount of screen time. A key moment in Season 4 is the duel between Prince Oberyn Martell and The Mountain. At this point, King’s Landing has reached a political boiling point. The ruling family, the Lannisters, is struggling to maintain its grip on the city while dealing with rival families near and far. After a major assassination, Tyrion Lannister is framed and put on trial by his own family. Tyrion has no chance to get fair justice, so he shocks the court by demanding a trial by combat. Bad idea. His sister Cersei summons The Mountain — a near-invincible warrior — to ensure that Tyrion’s champion is quashed and Tyrion faces execution. After Tyrion’s main guard wisely declines to fight, Prince Oberyn steps forward, seeing it as a chance to avenge his sister Ellia who was killed by The Mountain. Well, the rest is history. Oberyn shocks the whole crowd by dodging and incapacitating his behemoth opponent… but he does not finish him off. Instead, Oberyn demands for The Mountain to confess his guilt. Presumably, Tyrion has prevailed, the Lannisters have been undermined on a big stage, and Oberyn has found closure for himself and his family. Except this is Game of Thrones, remember? Oberyn looks away for just one second when The Mountain trips him, places him in a chokehold, and bashes out all his teeth. 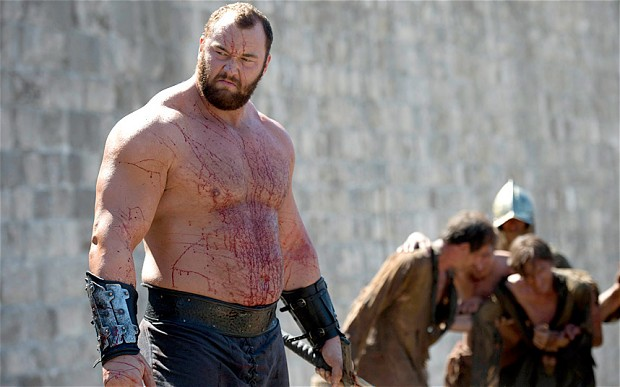 As Oberyn screams in pain, The Mountain admits in grim detail what he did to Ellia as he crushes Oberyn’s head. The violence of this death and the sudden turn of fate are borderline nauseating. That feeling is made all the more painful because Oberyn was one of the only people who did not judge Tyrion by his appearance — for all his arrogant, womanizing ways, Oberyn was a good man. Game of Thrones fans are still recovering. Allowing certain characters to die is often an essential part of any good drama. Writers need to know when a particular arc or storyline is spent and can use such a device to push the show’s narrative (or other characters’ development) in a good direction. But even a well-conceived idea can be poorly performed. Following the above guidelines can help TV shows to avoid the most egregious mistakes and to continue making insightful entertainment. Never read anything like this before, but this is really important! Do you ever share your work on any TV/film sites? Would you be interested in cross posting your work on Moviepilot.com as well?